Life on the Kibbutz continually reinventing itself. In February, I returned to Israel for a visit with old and dear friends. Their home since childhood is the beautiful Kibbutz S’dot Yam, in Caesarea. 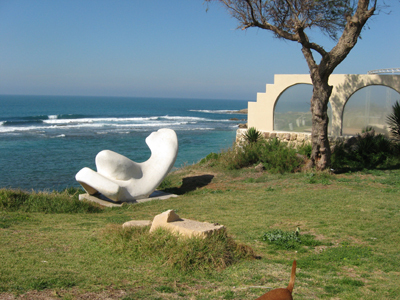 Located on the beach, adjacent to the historic restoration of the ancient Roman port, it is an old and successful Kibbutz – once home to Hannah Sennesh. There are still the traditional cows and bananas raised there, but its chief economic engine is now the manufacture of Caesarstone –-- beautiful tiles and counter tops. Personally, it was an emotional but a happy visit. I was delighted to be joined by my granddaughter who is studying in Haifa. When I was last in S'dot Yam, four years ago, I went with my husband, but on this visit I came alone. Together with my friends, we planted an olive tree in Richard's memory. We dug the hole for the tree in view of Sarale and Yigal's back porch, the quintessential kibbutz living space. I attached to the young tree a weathered stone in the shape of a heart with a hole in it which I had found as I walked on the nearby beach. The thought of his tree growing and providing olives for people he loved is a comforting one. 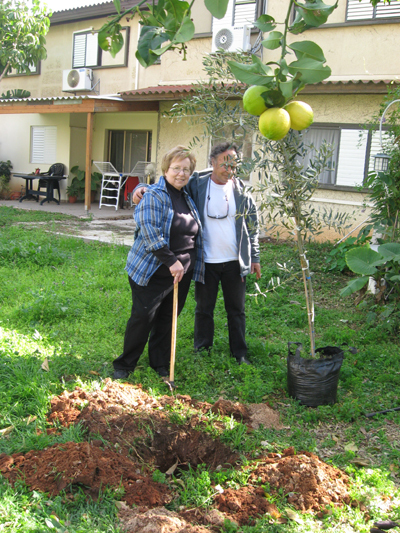 Susan Frost and her friends Sarale and Yigal plant an olive tree in Richard Frost's memory. Life on the Kibbutz is not as simple as we might like to think. Times and feelings change and the agricultural movement that provided the backbone of Israeli society is becoming irrelevant to a high-tech nation of city dwellers. A few years ago, when S'dot Yam's leadership realized that their own children were not returning to continue to build the society their parents or grandparents had begun, they asked themselves and the children, "What would it take to bring you back here to live?" The members instituted some overwhelming changes –-- economic and social –-- and the children came home! Today the Kibbutz is teaming with children and new home construction. The Gan is so popular, that families from the wealthy town of Caesaria pay tuition for their children to attend, providing another revenue source for the community. The Kibbutz economy has shifted radically towards a pay-for-what-you-want system. It is not the Kibbutz of the Halutzim, but it is a thriving and responsive society, providing a good life for its members. “Hioli,” a sign ahead said, and we headed towards an attractive new building. We paused briefly to allow a mother and baby to get into a car where they stayed dry. Another moment in the rain, and we were warmly welcomed into a large cheerful space, edged by a kitchen and dominated by a long table and chairs. We hung up our dripping clothes and were offered tea and towels. “Where are we?” I asked, though artistic pictures of pregnant bellies on the wall were already giving a hint. “Hioli,” it turns out, is the center you always wished for --- for yourself, your daughter or the mother of a child you love! Although I had never even imagined such a place, its appeal, as well as the logic and necessity of its existence, was instantly apparent. Mothers and mothers-to-be come together here in a warm, supportive atmosphere, learning about their bodies and their babies. The Center, under the direction of long-time kibbutz member and certified-in-everything Marcy Givah, offers childbirth classes, labor and delivery support, doula services, nursing advice and baby care. The heart of the center is a large, softly lit room, beautifully covered in thick blue mats. Under airy white curtains, low benches edged the room. Colorful pillows – wedges and rings, large and small, provided bright touches and support for pregnant bodies and nursing babies. This is the central gathering space as well as the place for mother/baby Yoga classes. Down a quiet corridor, there were small rooms for massage and rest. The staff of Hioli cares for a baby for a few hours while her mother’s needs are met! Consider the simple genius of that: a place to allow an exhausted mother to take an uninterrupted nap! 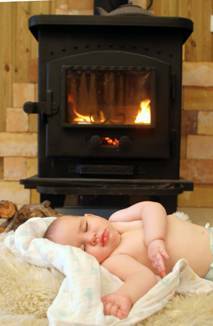 Combining competency and friendship, this wonderful haven seems to offer sensible and loving solutions to the stresses of those trying and hormone-loaded days of pregnancy, childbirth and early infancy. Mothers benefit both from experienced professional guidance and the companionship of other new moms. As the wind calmed and the rain slowed a bit and we headed off into the brightening sky, I was again amazed at the elegance of this Kibbutz’s solutions to life’s challenges. Suzi Frost is a teacher who periodically comes out of retirement to substitute in local schools, to the delight of students and school administrations. Gardening is a passion, second to her devotion to her grandchildren and their parents.